LOVE your layout! So cute! Love your use of all the different papers! Hippity hop. What a great layout, so happy. Tfs. What fun moment to capture! And your page looks great too. I love the idea of cutting a background like you did with the polka dots. Thanks for sharing. Adorabel layout! Really like the happy diagonals and the cloud shape. The paper you chose really pulled the colors out of the photos. As a mom of two boys, I love being able to use bright colors whenever I can. This collection is really great! Thanks for sharing! Love the polka dots too :) Great layout. How totally cute! This is one of my fave collections for sure and you did an amazing job with it! Such a great layout! The stripes along with the lettering are just so FUN!!! Love that photo and the silliness they display. Hammin' it up on camera is priceless!!! I just love how you used these papers! Such a fun and cheerful page, thanks for sharing and thanks so much for the hop. EP rocks!!! Cute photo! I have many just like this! Love the colors! What a fun page! I love this collection! Love the alpha for your title! Adorable page! YOur page is so cheerful and happy! What a fun layout! I really love that font and such a funny photo! That is such a cute photo! Loving how you did your title with the border on top of it! Thanks for the chance! Super cute layout and this collection really does make one feel happy! Love the bright colors and designs! Lovely page, this is such a happy collection! Carefree and fun. You captured a fun moment and I love your style. Its a really fun happy layout! Love it! Fun layout! Love bright colors, thanks for sharing! The scallop top border above your title is such a fun design element! What a great layout! I love the layout, especially using the Kraft background. I am doing my entire Disney album with a Kraft background to keep the album consistant. TFS! Totally fun pic and page! Great photo of some very happy kids! Cute layout! I love those letters! 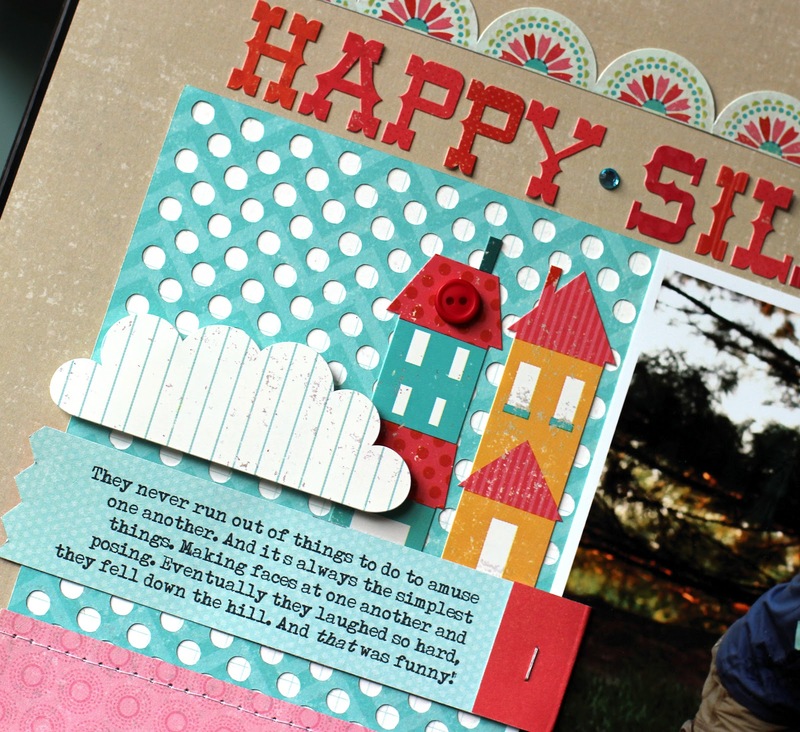 great layout - I love the journaling block! and what a great picture! Love how the title goes across the page! How happy and bright and fun! Sweet layout! I have added the So Happy Collection to my wish list! Love it! I love the mix and match of patterns. That is such a cute picture! I can see why you just chose the one. Love, love this layout. So fun. Thank you for a chance to win. Great job! Thanks for sharing~! Another cute layout, Nancy!! What a fun photo too!! Cute! Love the layers and your stapled journaling. Also, clouds are my THANG right now, so I'm going to love it just cause of that! Cute layout! Love that pic and love the papers you chose to showcase it. Great job. Fun page! Love all the colors and the dot paper really adds texture! Wow, awesome LO. I love using bright colors on neutral backgrounds for the same reason you said. It makes them pop. fabulous lo!!! funny picture and i love the alphabet stickers!!! LOVE all the colors! The kids are too cute! CUTE! Love the polka dots. What a cute page! I too love the polka dots. I also love the stripes and the sticker letters you used. Nico is so lucky to have so many cousins to play with and build such great memories. LOve the Carnival Font Alpha stickers in Red adds such a *spark* to your layout! Love all the colours in this collection! I love EP papers. All these projects are great. So cute, love the colors and the silly photo! Such a cute page. I love that picture!! Sweet. Thanks for the chance to win some great EP product. Lovely LO, you are totally right about a neutral background made pop up the other colors. Wonderful, bright layout. Totally cool! Fantastic show of the new EP papers and that photo is the best! Love it when you can catch that on "film". love the dots..I really need a cameo..one day! Your layout is so bright and fun. Love it! Love the layout. I could see my grandchildren acting like these cousins. Super cute! These papers are perfect for that photo! Cute layout. LOVE ALL your layouts Nancy! I like the Kraft against the bright papers - good combination. Echo Park paper just makes me happy! Gorgeous! I love all the different borders. Such a sweet photo. :) Gotta love Echo Park! This is such a great page! Thanks for the inspiration! Fun layout & great photo! Such a cute layout! I love the colors!! Love the colours. Great layout! What an adorable LO!! Love the bright colors!! Love the colours and the cute Layout !!! 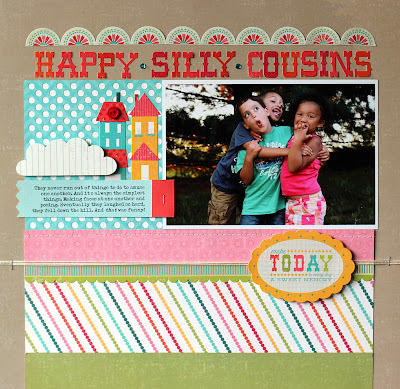 What an adorable LO... love the papers and colors you've chosen. What a great pic on a great layout!! Love the colors. Awesome page! The colors are so cheerful! Love your title and the border on top as well as your textured polka dots. tfs. Your title says it all, great page. Great layout - I love the mix of colors, textures and patterns. And I'm totally stealing the polka dot idea. Totally adorable layout! I sometimes don't have the best photos to scrap either, but any photo is better than none, and sometimes, the imperfect photo helps tell the story! I love your simple color block layout and that journal strip is great!!! I just love the bright cheery colours of this collection! Thanks for sharing. Love your layout. What a fun collection! What an adorable layout. I love the photo and the perfect papers for it. Beautifully done. you are right, I love the font1 great colors and super cute pic! I love your work Nancy! You always do such an awesome job! What a gorgeous collection! I love those beautiful colors. Such an adorable LO!! LOVE the bright, cheery colors, goes perfectly with the photo!! I love how you did the polka dotted block, will have to try that! Dd you make or buy the Cameo file? Cute layout, i love the journalling tag, thanks for telling how you made it. Love those alphas and the bright and happy colors of So Happy! love the scallops above the title! Gorgeous layout. Thanks for sharing! What a lovely collection! Thanks for sharing! Nancy, your layouts NEVER disappoint! So bright and fun....gotta love Echo Park! Love your layout Nancy! Echo Park is one of my favorites. 2 Peas name is AnissaScraps. Beautiful layout, love the design! Love this layout! That picture is too cute! Fantastic layout!! so fun with the carnival letters! What a lovely, bright, happy page! Cute! I love the way you blocked the layout especially the title portion. Adorable layout and what a fun photo! Love the bright fun colours! Beautiful layouts!! Thanks for sharing them with us and the chance to win!!! Great layout and love the alphas! Cute. The bright colours of this collection are perfect for this layout. I love the way you did the title and framed it with the scalloped strip! Very cute page! I love these happy colors. Fun picture and LO! Love the photo...happy kids make the best layouts! Awesome photo. I love the title! Love the layout and the bright, happy colors! Love too that you featured a single photo! I love the simplicity and colors! cute layout!!! I love the Echo Park supplies. 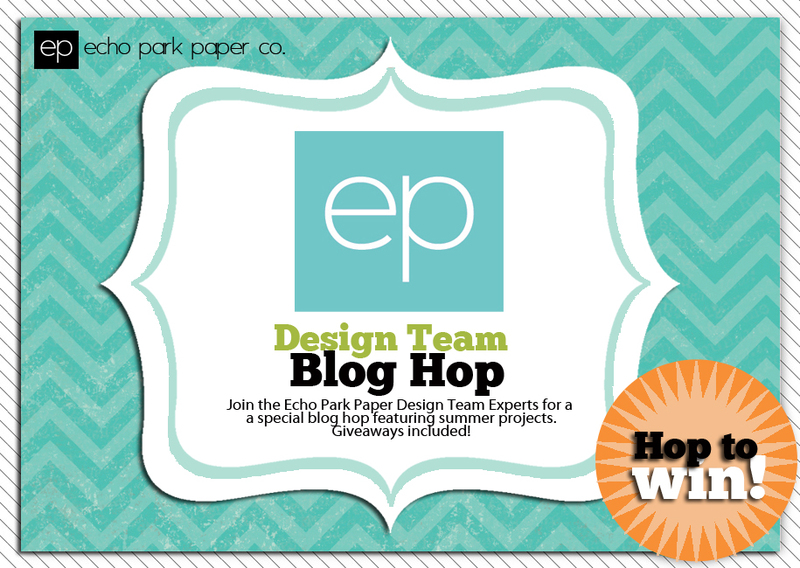 I would love me some Echo Park paper!! love this layout! I especially love those alphas! Great layout. I love the colors !! TFS. I'm totally in love with "so happy" collection papers! what a cute layout! Thanks for the chance to win! xoxo!!! Such a fun, happy page! Love the house and cloud cluster! I really like the lettering in the title. What a FUN photo and great FONT !!! Sweet page design! Love the mix of all the different papers and the stiching, great picture too! What a great layout...love the different papers you used and how you used only one pic to show the very cute relationship. Wow! You've inspired to buy another EP collection. Love the letters too. Also think the layout looks amazing on the Kraft! Great job! Love the papers and the layout! Love the layout! That pic is too cute. Love your title and that font. Wonderful! oh that picture is too cute. love the font too! I really like the depth that the simple polka-dot cutout adds. Great font and bright color scheme! Beautiful layout, as usual. I love your work and tutorials. The font of the letter stickers on the collection really appeals to me. Love the bright color you used! Such a Beautiful layout! Great layout. Love those carnival alpha stickers. Love your layout, especially the scallop border trim at the top. An Echo Park embellishment? This is a really fun LO. I love the title of the page along with the half circle boarder, really cute idea! Darling layout! I love the texture all the colors & patterns bring! Super cute layout!!! Kids make our scrapbooking chores so easy LOL! Lovely page! The children are so sweet! Love it! I love the bright colors in both the photo and the paper. Beautiful colors! Great layout! Beautiful, fun, and simple...love it! Funny photo and lovely LO! I do love the Carnival Letters on this layout and the layout is simple to achieve myself. Thanx for sharing it! I love your page. I think that is one of my favorite sets! Great page! This collection is one of my favorites. Love the LO and the great photo! That is a happy layout. Love this paper collection too...and all Echo Parks new collections at CHA. I love your LOs Nancy! They fit my style perfectly because they are brightly-colored with a lot of clean lines! Love them! Thanks for the chance to win! Love this! Your layout is gorgeous. Love the one photo. Thanks for the chance to win some great EP products. I love the bright and cheery colors of your layout. Terrific design and love the title. Great layout--I like the fun colors.